Before subject or composition, before values, shapes, or color, before you pick up a brush you must first have a visual idea, an artistic concept. 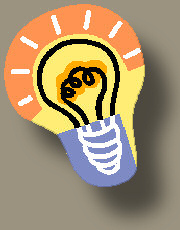 Beg, borrow or steal an idea, but get one! Only Emotion comes before this. All successful works of art have a visual concept or idea. Work that does not have a visual concept may be a sketch, a study or a ho-hum painting. If you have an idea firmly in mind you're halfway home. What are some concepts painters have used to insure their work reaches the level of true art? Ask yourself what is it about the subject that caught your eye; what are you ..."thinking and feeling in relation to the subject. What was the first split second impression. Why did you stop to photograph it? Was it the shape, color, texture, contrast, simplicity, atmosphere, or the light?" Al Brouillette, The Evolving Picture., pg 10. If you have firmly in mind something from the first list, then you can begin to focus on something from the second list. Facts alone are boring, emotion and relationship are interesting. "Without a good idea at the start only failure can result." At first, learning to paint must include painting things well. This is reasonable. 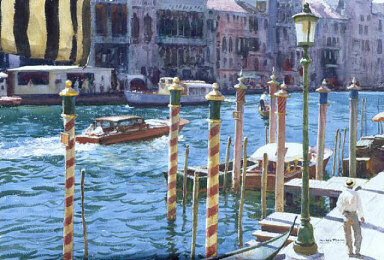 Consequently, most painters feel they have succeeded in this quest when they can paint the subject convincingly and capture a look of reality. However, any thinking person might ask if more is possible than this technical proficiency. If you have ever been moved by a great work of art, you may have wondered if it possesses something else. ''How can paint, shapes, color, and edges be so compelling?'' Paintings with more impressive technique often lack this ability to move the viewer. Instead, they impress with rendered detail and inspire wonder at the work involved. Some may lack technical prowess and instead rely on sentiment or storytelling. Some may simply depend on bravura brushwork. Standing before a great painting, the inquisitive painter must wonder where the magic lies. The image compels you to examine the surface beauty and return again and again, leaving a lasting impression. What is the lure? The underlying culprit is the concept. Rather than seeing each object as a separate entity, concept creates a relationship between objects, thereby creating something greater than the whole. This underlying visual message creates a beauty beyond subject matter and is the real reason behind the painting. Abstract ideas, though difficult to grasp, directly affect the development of an artist. The less personal and the more universal the motive, the more compelling and sublime the statement becomes. If you just copy your subject matter you're missing ninety per cent of the art. Visual concepts must be understood before you can learn to paint. Concepts are plans for solving problems of light, air/space, dimensions or form, color, value, edges. How the painting will be read, the value range, the colors that will be used, the brushstrokes, etc. Great paintings are simple in concept. Great paintings have one essential visual idea. They have an underlying idea about color, shapes, values, edges, alone or in combination. These are things that paint can do. The idea, or visual concept, creates a relationship between objects. This is an idea that you find exciting or meaningful to the extent that you are willing to put in the hard work of abstracting from reality and showing others in paint what it is you find important. You must have this fixed in your mind and work towards it in the final work. Others may look at your chosen subject and easily miss what is so obvious to you. On your canvas you do not merely recreate the subject in paint. Knowing what can be done with paint you are saying something in this scene connects me with a universal truth, with an elevating thought, or an inexpressible feeling-tone. 3. Movement of Light, e.g. from left to right. Why start a painting before you have a visual concept or idea? Use one or more thumbnail sketches to find a good concept for your painting. Write down in words the idea you have decided on. Evaluate your painting...did you communicate your idea? Analyze the old masters' and new masters' paintings. What visual concept or idea do you see? Make a note of it. Try the same thing in your painting. "The difference between a professional and an amateur is: A professional borrows from a master and an amateur borrows from an apprentice." 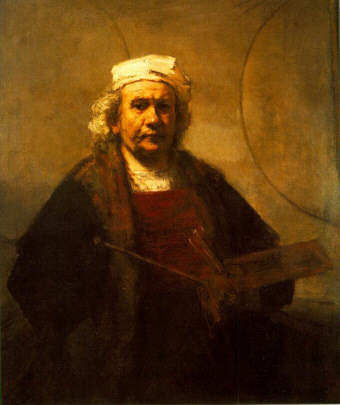 What is the visual concept in this self-portrait by Rembrandt? Hint: it's not the man. Light and Shadow or Chiaroscuro. See how the figure seems to be emerging from the shadows? Very dramatic and entertaining. Rembrandt used this idea a lot, but it's only one possibility. Imagine this same painting, but with uniform lighting. Boring. 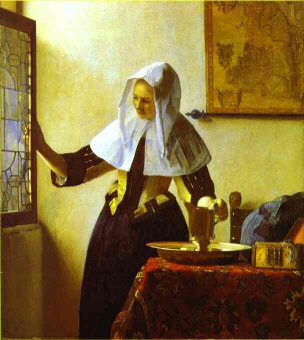 What is the visual concept in this painting by Vermeer? It has to do with light, but this time it's about light washing across the painting from left to right. That's the artistic idea behind the painting that makes it hold together as a work of art, relating all the objects to one another. The subject matter is a woman with a jug and various other subordinate objects. Imagine this picture with uniform frontal lighting. It would still have great composition, great shapes, lines, textures. But the unifying principle is gone and with it the magic. 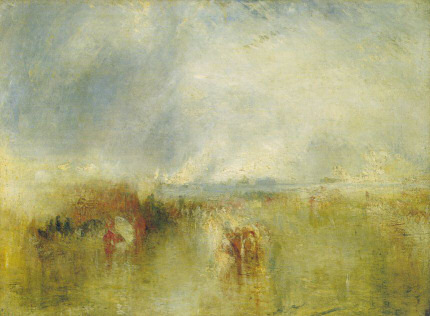 And this one by Turner...what's the idea? How misty, indistinct and abstract can I go and still have a landscape? 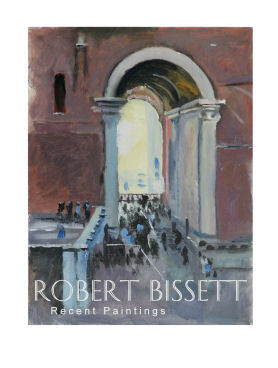 The remarkable atmospheric feeling of volume, space and light quality is what this is about. A built environment on the ocean unique in all the world.